Shower them in luxury with our Marquis by Waterford® Rainfall vase and bouquet. Crafted in stunning detail, our crystal vase features an exquisite rainfall design. This brilliant collectible vase holds a lush gathering of colorful blooms, artistically hand-arranged by our skilled designers. We can’t imagine a more beautiful expression for someone who means everything to you. 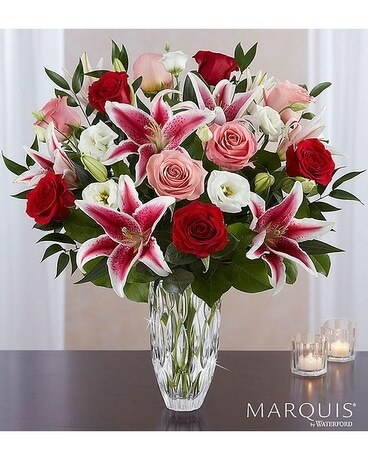 All-around arrangement with long-stem red and pink roses; pink Stargazer lilies; white lisianthus; accented with assorted greenery.